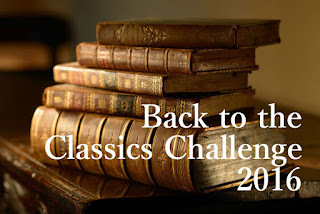 I have never taken part in a reading challenge before but I'm going to attempt one for 2016 - The Back to the Classics Challenge. I think it's important for me, as a homeschool mom who plans to educate her children with beautifully written books full of great ideas from great minds, to continually get in touch with those minds myself. Hopefully this challenge will help me stay disciplined to actually finish the books I start! I copied and pasted the categories from the above link (the official rules are listed there). My books choices are in bold, although I'm having a hard time deciding on a couple of the categories! Many of these are free for kindle (score! ), and I've linked those. A Tale of Two Cities by Charles Dickens - I've never read Dickens (wait...maybe I read Great Expectations in school at some point?) and picked this up recently at a library book sale. I've heard it's a good first Dickens read. Persuasion by Jane Austen - I've only read Pride and Prejudice by her, but several people have mentioned that Persuasion is their favorite Austen so I figured it would be a good one. The Betrothed (I Promessi Sposi) by Alessandro Manzoni - This is a scheduled book discussion on the AO forums and a lot of people are excited about it, so I thought maybe I'd join in lurk. Go Tell It on the Mountain by James Baldwin - I don't know much about this book, but from reviews, it looks to be very powerful. Utopia by Thomas More - A third book discussion book, plus it's short, so it'll cancel out I Promessi Sposi! Phantastes by George MacDonald - I just want to read more of MacDonald. A Study in Scarlet by Sir Arthur Conan Doyle - I've always wanted to read Sherlock Holmes, and I own all of them, so what a perfect time to dive in! Anne of Green Gables by L.M. Montgomery - A classic I missed in childhood (along with many, many others!). I read somewhere that this book was written for all ages, but only in the last century has it been considered a children's book. So hopefully it'll count. Uncle Tom's Cabin by Harriet Beecher Stowe - Apparently this is one of many banned books that shaped America. I've heard it's really good. To Kill a Mockingbird by Harper Lee - I haven't read it since high school. It's been sitting on my shelves and I've been eyeing it. Nine Stories by J.D. Salinger - I had a hard time finding a collection of short stories. I found a decent list here, and our library has this one. The Martian Chronicles by Ray Bradbury - I've heard great things about this book, but I would have to find a copy. You know, I've heard that about A Tale of Two Cities. What would you recommend by Dickens? I'm almost finished with it now, and next week I'll be discussing it with a "schole" group I'm involved with. One of the things I have always appreciated about Dickens is his humour, particularly the almost caricature-like way he describes his characters. There was less of that in A Tale of Two Cities. It is more serious. Having said that, I think it's now my favourite Dickens book. I narrated each chapter to myself, and this has made it really live in my mind. (This did make it take a LOT longer to read, I must admit.) I highly recommend it. Great list! Several other people have listed I Promessi Sposi, which I'd not heard of, so I'll have to check it out. Thanks for signing up for the challenge! Good choices! Anne of Green Gables is one of my favorite books. My dad read it for the first time when he was in his 40's and thoroughly enjoyed it. He would stop up to read sections from it to us even though we'd already read it multiple times, he enjoyed it so much! lol Enjoy Sherlock Holmes. Love his books, too! I'm excited to read Persuasion as well as it's a Jane Austen I've not read yet. Nice list. I am so tempted to keep changing my list because of what I see others have chosen. I read A Tale of Two Cities as a first Dickens and really *really* enjoyed it. But honestly it was so slow for much of it that I had to force myself to finish it. Once I got to a certain point I could not put it down. Excellent book. I've actually never read another of his but with this challenge I'm changing that.